George Edward Lodge - Fox with Leveret amongst snow fields - Online gallery supplying original fine art. Trending Modern British and Contemporary Welsh. Available for sale from Big Sky Fine Art; this original oil painting by George Lodge.<br> The painting is presented and supplied in a sympathetic contemporary frame behind glass. <br> <br> One of the world’s leading bird artists for well over half a century, George Lodge was a naturalist, a falconer, craftsman and conservationist. His work, in various mediums, is acclaimed for being anatomically accurate, detailed and showing a real understanding of the subject.<br> <br> George Lodge was born at Scrivelsby, near Horncastle, Lincolnshire. His father was a canon of Lincoln and he was the seventh of eleven children. From an early age he showed an interest in both art and nature and spent many hours observing and sketching his surroundings. He was initially educated at home, and he combined this with developing a skill as a taxidermist and a love of falconry. His brother Reginald shared his interests and he later became a pioneer of bird photography. <br> <br> George attended Lincoln School of Art and won many prizes there for his drawings. At the age of sixteen he became apprenticed to Whymper’s – the leading London wood engravers. The work he produced there can be seen in W.H. Hudson’s “British Birds”, published in 1896, which includes one hundred of his wood engravings.<br> <br> Lodge travelled extensively during his career in order to observe and paint birds, and as a sportsman. These visits included Japan, Ceylon, the United States and Scandinavia. He was however most at home in the Highlands of Scotland painting eagles and hawks.<br> <br> Lodge was a keen falconer and during his time in London – he could often be seen with a hawk on his wrist as he felt that the noise and bustle of the city were the best place to accustom the bird to any distraction, making it more effective in the field. An active member of the Old Hawking Club, he was also an excellent shot, winning trophies for marksmanship during his time as a member of the Army Volunteer Reserves, City of London.<br> <br> In 1920 he moved to the aptly named “Hawk House” in Camberley, Surrey, where he lived with his sister and niece. His studio there was a veritable treasure of preserved birds, eggs and cabinet specimens and he spent his days, pipe clamped between his teeth, painting, corresponding and taking a full part in the community and in those cause which he held most dear.<br> <br> Born in the same year, Lodge was considered by many of his peers to be the equal of Archibald Thornton, probably the best-known avian artist in history. The two artists worked together on a commission for the New Zealand Government, capturing the likeness of all their native birds. The plates that Lodge produced for his work were published later in a book by C.A. Fleming. Lodge and Thornton admired each other’s work and over later years they maintained a friendly acquaintance, tinged with a little gentle rivalry. Lodge was also a friend of J.G. Millais.<br> <br> Lodge’s work appears in many publications, including “The British Bird Book” by F.B. Kirkman, but he is most famous for illustrating D.A. Bannerman’s “Birds of the British Isles”, which appeared in twelve volumes between 1953-63. He began this work at the age of 82, completing it in his ninety-second year and in all produced illustrations for 389 plates depicting 426 species of birds, each painted against an appropriate background, an incredible feat of skill, patience and dedication. <br> <br> Lodge published his own story, “Memoirs of an Artist Naturalist” in 1946.<br> <br> Although primarily known as a bird artist Lodge was well established in his later years as a venerable artist of other wildlife too and he spent many contented hours studying the mammals of London Zoo.<br> Indeed, he was a fine all –round naturalist with a great interest in reptiles, insects, butterflies and moths. His entomological collection is held at Bristol Museum, and some of his paintings and sketches are held by the Natural History Museum.<br> <br> Lodge took an active part in the conservation of wildlife; he served for many years on the executive Council of the Society for the Protection of Nature Reserves, and he was also an active member of the International Committee for Bird Protection.<br> <br> When Camberley and District Natural History Society was established in 1946 George Lodge and Filed Marshall Lord Allanbrook were made joint Vice-Presidents. Lodge was also Vice President of the British Ornithological Union, the only bird painter to be so honoured. <br> <br> One of his last acts shortly before his eyesight became impaired was to institute a trust fund for the publication of original works in natural history <br> <br> George Lodge led a long and industrious life. In his eighties he managed to knit over three hundred scarves for RAF pilots in the Second World War. His mind remained active and, despite failing eyesight, he continued to sketch the birds in his garden right into his last year. He died on 5th February 1954, aged 93. <br> <br> Lodge was fondly remembered as “an Englishman of fine and generous character”. He was an attractive and kindly man, from middle age often dressed in plus fours and had a snowy white beard. He was known for his indomitable spirit, his gentle humour and was always willing to help young and aspiring artists.<br> <br> Lodge’s paintings were exhibited regularly at the Royal Academy from 1881 to 1917, and also at Suffolk Street and other leading London galleries. The Tryon Gallery held an exhibition of his works in 1965, mostly birds of prey. In 2010 the George Lodge Trust held an exhibition at Natural Art, Gloucester to mark the 150th anniversary of his birth.<br> <br> This wonderful original oil shows a red fox holding a Leveret, a young Hare, which he has just caught. The Leveret hangs limp in the Fox’s jaws. The Fox flashes a look at us; his eyes are wild and intense. He is hunched and poised for a moment, before he darts off. All around is snow, deep and soft like a blanket, covering all the ground. There is no sky; we are entirely focused on this one moment of activity, of survival, in the otherwise frozen landscape. In the foreground are the fox’s footprints, so realistic you feel you can reach out and touch the dints in the snow. This piece is a stroke of genius from one of the great wildlife artists of the nineteenth/twentieth century. Available for sale from Big Sky Fine Art; this original oil painting by George Lodge. The painting is presented and supplied in a sympathetic contemporary frame behind glass. One of the world’s leading bird artists for well over half a century, George Lodge was a naturalist, a falconer, craftsman and conservationist. His work, in various mediums, is acclaimed for being anatomically accurate, detailed and showing a real understanding of the subject. George Lodge was born at Scrivelsby, near Horncastle, Lincolnshire. His father was a canon of Lincoln and he was the seventh of eleven children. From an early age he showed an interest in both art and nature and spent many hours observing and sketching his surroundings. He was initially educated at home, and he combined this with developing a skill as a taxidermist and a love of falconry. His brother Reginald shared his interests and he later became a pioneer of bird photography. George attended Lincoln School of Art and won many prizes there for his drawings. At the age of sixteen he became apprenticed to Whymper’s – the leading London wood engravers. The work he produced there can be seen in W.H. Hudson’s “British Birds”, published in 1896, which includes one hundred of his wood engravings. Lodge travelled extensively during his career in order to observe and paint birds, and as a sportsman. These visits included Japan, Ceylon, the United States and Scandinavia. He was however most at home in the Highlands of Scotland painting eagles and hawks. Lodge was a keen falconer and during his time in London – he could often be seen with a hawk on his wrist as he felt that the noise and bustle of the city were the best place to accustom the bird to any distraction, making it more effective in the field. An active member of the Old Hawking Club, he was also an excellent shot, winning trophies for marksmanship during his time as a member of the Army Volunteer Reserves, City of London. In 1920 he moved to the aptly named “Hawk House” in Camberley, Surrey, where he lived with his sister and niece. His studio there was a veritable treasure of preserved birds, eggs and cabinet specimens and he spent his days, pipe clamped between his teeth, painting, corresponding and taking a full part in the community and in those cause which he held most dear. Born in the same year, Lodge was considered by many of his peers to be the equal of Archibald Thornton, probably the best-known avian artist in history. The two artists worked together on a commission for the New Zealand Government, capturing the likeness of all their native birds. The plates that Lodge produced for his work were published later in a book by C.A. Fleming. Lodge and Thornton admired each other’s work and over later years they maintained a friendly acquaintance, tinged with a little gentle rivalry. Lodge was also a friend of J.G. Millais. Lodge’s work appears in many publications, including “The British Bird Book” by F.B. Kirkman, but he is most famous for illustrating D.A. Bannerman’s “Birds of the British Isles”, which appeared in twelve volumes between 1953-63. He began this work at the age of 82, completing it in his ninety-second year and in all produced illustrations for 389 plates depicting 426 species of birds, each painted against an appropriate background, an incredible feat of skill, patience and dedication. Lodge published his own story, “Memoirs of an Artist Naturalist” in 1946. Although primarily known as a bird artist Lodge was well established in his later years as a venerable artist of other wildlife too and he spent many contented hours studying the mammals of London Zoo. Indeed, he was a fine all –round naturalist with a great interest in reptiles, insects, butterflies and moths. His entomological collection is held at Bristol Museum, and some of his paintings and sketches are held by the Natural History Museum. Lodge took an active part in the conservation of wildlife; he served for many years on the executive Council of the Society for the Protection of Nature Reserves, and he was also an active member of the International Committee for Bird Protection. When Camberley and District Natural History Society was established in 1946 George Lodge and Filed Marshall Lord Allanbrook were made joint Vice-Presidents. Lodge was also Vice President of the British Ornithological Union, the only bird painter to be so honoured. George Lodge led a long and industrious life. In his eighties he managed to knit over three hundred scarves for RAF pilots in the Second World War. His mind remained active and, despite failing eyesight, he continued to sketch the birds in his garden right into his last year. He died on 5th February 1954, aged 93. Lodge was fondly remembered as “an Englishman of fine and generous character”. He was an attractive and kindly man, from middle age often dressed in plus fours and had a snowy white beard. He was known for his indomitable spirit, his gentle humour and was always willing to help young and aspiring artists. Lodge’s paintings were exhibited regularly at the Royal Academy from 1881 to 1917, and also at Suffolk Street and other leading London galleries. The Tryon Gallery held an exhibition of his works in 1965, mostly birds of prey. In 2010 the George Lodge Trust held an exhibition at Natural Art, Gloucester to mark the 150th anniversary of his birth. 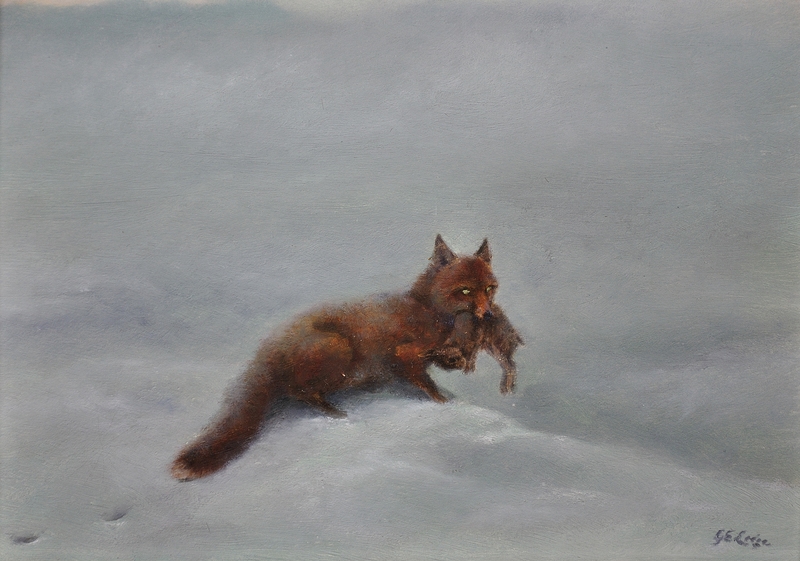 This wonderful original oil shows a red fox holding a Leveret, a young Hare, which he has just caught. The Leveret hangs limp in the Fox’s jaws. The Fox flashes a look at us; his eyes are wild and intense. He is hunched and poised for a moment, before he darts off. All around is snow, deep and soft like a blanket, covering all the ground. There is no sky; we are entirely focused on this one moment of activity, of survival, in the otherwise frozen landscape. In the foreground are the fox’s footprints, so realistic you feel you can reach out and touch the dints in the snow. This piece is a stroke of genius from one of the great wildlife artists of the nineteenth/twentieth century.